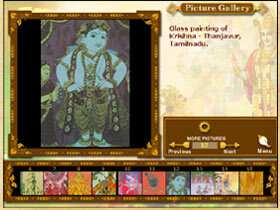 Bhagavad Gita, The Multimedia Book in CD-ROM. Harmony in variety - this statement includes within itself an area which has to be explored to understand word harmony. The supreme truth has always had its own ways of impressing the common man. It has either taken appropriate form according to time or has acted through mortals. This collection of various thought forms talks a language of its own, whose audibility can be heard by those who try to see the supreme through oneself. The physical images developed through the use of nonliving artifacts or intelligence has witnessed the evolution of civilization that has respected these forms for showing various channels of looking at truth.